Welcome to week 5 of the ‘The Desperate Housewife’s Quilt’. Todays block is all about combining Half Square Triangles and applique. Remember, this is not a quilt-a-long. Just follow the blog every week and pick and choose which blocks you would like to make. I will be injecting some uniqueness into traditional blocks, applique, three dimensional, crazy and thread-art blocks. If you make a block you can post it on the Flickr group for everyone to enjoy. Also, I have this nifty button under each post that allows you to save the post as a PDF. 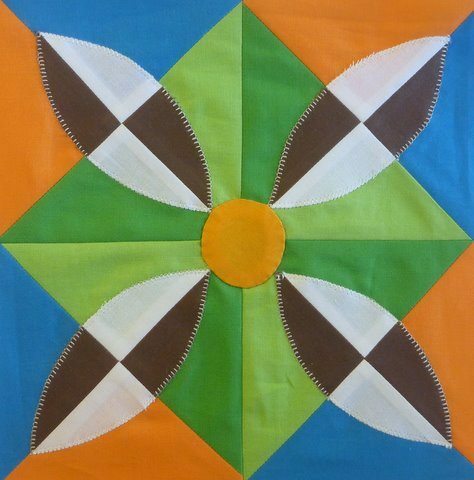 There is another gorgeous block waiting at Aunti Pami. Pam has designed a unique wonky house block using a freezer paper technique. It’s hip and groovy and blooming good. I have chosen some contrasting solids for this block. I think it would work well with any combination of fabrics as long as they were small prints. Maybe a fussy cut centre for the centre circle would be fun. I have used Heat n Bond Light fusible webbing for the applique. Cut 2 x 6″ squares of the blue, orange, light green and dark green fabrics. Place the light green and dark green squares right side together and the blue and orange squares right side together. Draw a diagonal pencil line on back of light green squares and orange squares. Draw in opposite directions for each set as shown below. Sew 1/4″ either side of the pencil line. Then cut on the pencil line and without separating the pieces make another diagonal cut. Make another cut from corner to corner. Press open your HST’s and lay them out to form the following pattern for the background. I press my seams open. You will have extras. Put them aside for later and I will show you a filler block to accompany this block. These leftovers will make another block. Sew the HST pairs together making sure the middle seams match. You will now have 4 hourglass blocks. Join the top pair and then the bottom pair. Join the two rows together to complete the background of the block. I press open all my seams so there is little bulk, especially in the centre where all the seams converge. Download the template document. Check print settings and make sure it is 100% and not ‘fit to page’ or scaled up or down. Make a template from mylar plastic of the circle. Trace around the circle and then cut 1/8″ from pencil line. Sew a line of running stitch around the seam allowance leaving a long tail and no knots. Pull the thread to gather around template. Starch heavily and let dry. When starch is dry, carefully loosen stitches and remove template. Remove gathering thread. Turn over and press and then pin to background. To applique circle to background, use a matching thread. The finer the thread the less noticeable. Make a quilters knot in the thread and start from the back and bring the needle up just under the edge of the circle. Take small stitches just grabbing the edge of the circle. The needle is horizontal and you start just a thread behind where you brought the last stitch up. Your stitches should be invisible. End by making a finishing knot on the wrong side of the block and leave a 1/4″ of thread tail. Hint. When threading your needle, leave the cotton on the spool, thread the needle and then cut. Threads have a correct way they should be thread through a needle. Breakage, knotting, and fluffing will occur if you place the thread the wrong way through a needle. Cut 2 x 1.5″ strips of the brown and white fabrics WOF (width of fabric). Sew the strips together, then cut into 2 3/4″ segments. Make a four x 4-patch from 2 segments. Press open seams. Trace the petal template onto the paper side of a fusible web product. Make sure you mark the vertical and horizontal registration marks. Cut around the petal shape leaving at least 1/8″ all around. Following the manufacturers instructions for applying the fusible web, iron to back of block, carefully lining up the registration marks to the seam lines. Cut around the shape on the traced template line. Peel off the backing paper. Hint. Most fusible web products like a cooler, dry iron. Moisture and excessive heat melt the glues that fuse the web to the fabric. Also, pre-washed fabrics grip the webbing more efficiently. The setting agents in the unwashed fabrics tend to inhibit binding. Lay the petals on the background, using the diagonal lines of the hourglass blocks as guides. (I removed the centre and drew a pencil line where the centre circle should be for this exercise). The inner tip of the petals should touch the centre circle. Using a blanket stitch, machine or hand sew around each petal. (Hand turned applique would be difficult with this design as there are so many seams making it bulky at the tips. Hand turned would be perfect if you used a feature fabric instead of a pieced block. The seams get in the way). Tilt the block 30 degrees, add a border and voila! a new design. On point with an alternative colourway filler block. Remember all those left over HST’s? They make a great alternative block in an on point setting with different colourway. If you prefer hand turned applique, try cutting the petals from un-pieced fabric. Don’t forget to leave a 1/8″ seam allowance to turn. I hope you enjoyed this block. I will be definitely making a quilt from this block. Next weeks guest blogger is Karen Wilson. I wonder what Karen has in store for us. Mine will be out of the tool box. This is a very cool block! Will be adding it to the "must make" list. I especially like the layout with the 30 degree rotation. ACK! Seeing my name there for next week made me realise how close it is!! Luckily I just finished up some details for mine this morning. This block is beautiful. I'm not ready to tackle something like this yet but you can bet it's on my "to-do" list. Very very very nice block. Love the images for quilts made with them. Wow, what a fabulous block.